The vibrant and juicy hues and chic geometric Swiss cross inspired seamless pattern featured on this style are sure to catch the eye! Classic typefaces are used but the minimalist design is kept playful with color. Simple and symmetrical, this design lends itself well to just about any event. Customize your Royal Suite party coasters for your special event today! Royal Suite party coasters are available in multiple shapes—3.9" round, 3.9" square with rounded corners, and others. They are extra-thick, 58-point paperboard. To give you an idea of how thick they are, a stack of a dozen coasters is about 3/4" tall. They are made of absorbent pulpboard to help protect your tabletops. 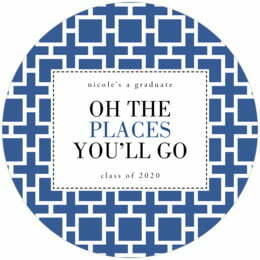 The coaster surface is finished with a smooth matte coating to provide beautiful, crisp printing. 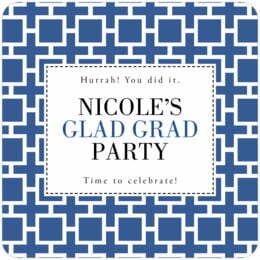 Party coasters are individually die-cut, so their top edge is soft and rounded. They are designed to be disposable, but they are durable and re-usable. If unused, they can be set aside as keepsakes and will last forever. Party coasters are printed on one side only. On the blank back, a small Evermine logo is tastefully debossed. Select the "Personalize" button to get started customizing your Royal Suite party coasters today!